The Department of Biostatistics is hosting Bin Huang, Research Professor at the Cincinnati Children’s Hospital Medical Center. Dr. Huang will be presenting on, "Doubly Robust Estimate of Causal Treatment Effect with the Real World Data." Statistical causal inference utilizing real world data can provide a more effective, efficient and timely way of understanding causal effect of a policy or intervention in a real world context. The fundamental challenge of causal inference, that is only fraction of the potential outcomes are observed, is made more complex due to selection bias, large dimension of covariates, and potential unmeasured confounders in the real world analyses. While propensity score methods are commonly used, the validity of its causal effect estimate hinges critically on the correct specification of propensity score model. When miss-specified, causal treatment effect could be seriously biased. Similarly, Bayesian approach to causal inference by directly modeling the outcome model could suffer from the similar issue with the miss-specified outcome model. Motivated by a comparative effectiveness research in children with newly diagnosed juvenile idiopathic arthritis (JIA), we propose a new structural model approach. The model reduces p-dimension of covariates to a two-dimensional balancing scores, conditional on which both propensity score and prognostic score balance achieved. We suggest the model can achieve unbiased estimate of the averaged causal treatment effect. Utilizing the well-known Kang & Schafer’s simulation design, the results from simulation studies show improved performances of the proposed approach particularly under the dual miss-specification setting. The case study is conducted in a small cohort of JIA patients. Further challenges and future directions will be discussed. The faculty fellows program provides participants an opportunity to collaborate with campus leaders on initiatives tailored to their background and interests. Dr. Bigatti will concentrate on projects related to faculty development, mentoring and faculty diversification. Bigatti has conducted extensive research on how individuals behave in and cope with stressful situations and how predisposing factors, individual resources and environmental factors affect the outcome of a chronically stressful situation. "I would like to see a renewed focus on faculty development and well-being, which will also contribute to student success," Bigatti said. Her scholarship of teaching focuses on improving the learning experience for students through course engagement, inclusive teaching, and understanding and improving the experiences of international students. Dr. Jay's discussion will explore how innovations may be translated into effective and lasting public policy that advance the security of the homeland and the health of the population. It will explore the nexus of military and medical science and the prominent roles the former Chairman of Medicine at IUSM, John B. Hickam M.D. and his father, Horace played in this history. The discssion will reflect on ‘warriors’ and ‘healers’. Come early for free pizza! Dr. Jianjun Zhang and his former PhD student, Dr. Wambui Gathirua-Mwangi, have published an article entitled “Metabolic syndrome and total cancer mortality in the Third National Health and Nutrition Examination Survey" in Cancer Causes & Control. Dr. Gathirua-Mwangi is the first author and Dr. Zhang is the senior and corresponding author. Other two authors are Drs. Patrick Monahan and Mwangi Murage. Read more here. 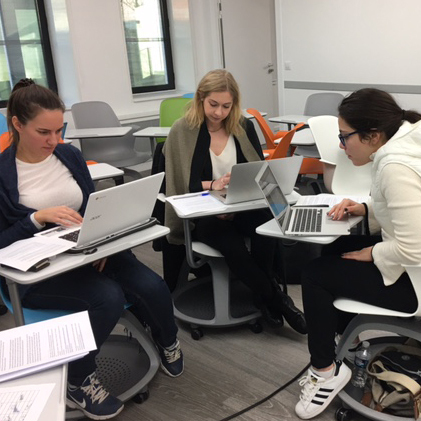 FSPH Associate Dean Sue Babich has been in Paris this week teaching global health policy to second year MPH students at the EHESP French National School of Public Health, with whom FSPH now has a partnership.